Memories of Lisbon / Recuerdos de Lisboa, originally uploaded by victor_nuno. Those were days of calm, in which I enjoyed knowing and speaking to people of Lisbon. I don’t know how many times I walked through the same square, … as it gave me that feeling of calm, and melancholy. I miss Lisbon. Aquellos fueron días de calma, en los que disfruté conociendo y hablando con gente de Lisboa. No sé cuántas veces pasé por la misma plaza, … pues me daba esa sensación de calma, y de me lancolía. Echo de menos Lisboa. 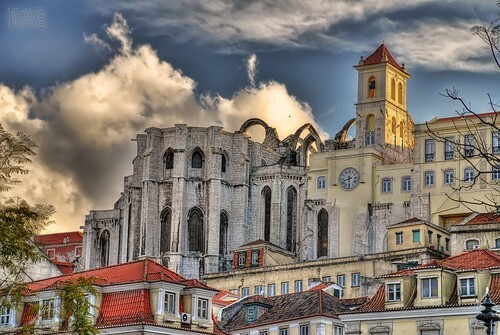 A great view of the "Convento do Carmo". Un HDR muy logrado! Los colores brillas de un modo maravilloso! Parece sacado de un cuento! When will you publish your GREAT WORKS? I love your photos, together with the words…. If you do so, I will book one immediately! Hi, I’m an admin for a group called Cultural Boxes, and we’d love to have this added to the group! This shot is absolutely beautiful and you’re an artist, we would like to add it in our fine group, thank you!